Setting: Ezra follows 2 Chronicles as a history of the Jewish people, recording their return to the land after the Captivity. Key verses: "The Passover meal was eaten by the people of Israel who had returned from exile and by the others in the land who had turned from their immoral customs to worship the Lord, the God of Israel. Then they celebrated the Festival of Unleavened Bread for seven days. There was great joy throughout the land because the Lord had caused the king of Assyria to be favorable to them, so that he helped then to rebuild the Temple of God, the God of Israel" (6:21, 22). Special features: Ezra and Nehemiah were one book in the Hebrew Bible, and, with Esther, they comprise the post-captivity historical books. The post-captivity prophetic books are Haggai, Zechariah, and Malachi. 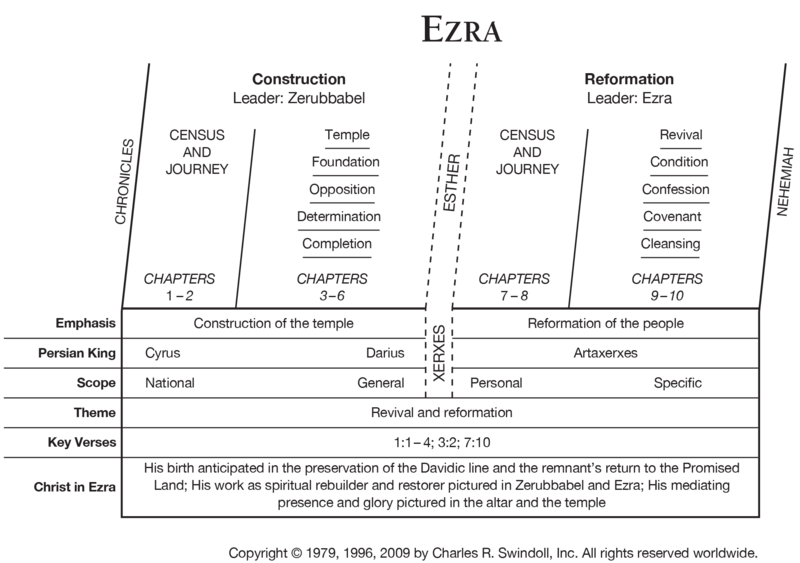 Haggai and Zechariah should be studied with Ezra because they prophesied during the period of the reconstruction. New Geneva study Bible. 1997, c1995 (electronic ed.) (Esd 8.23). Nashville: Thomas Nelson. God through his faithful prophets, said that the people of Judah would be taken into captivity because of their sinfulness. But he also promised that they would return to Jerusalem and rebuild the city, the Temple, and the nation. Isaiah 44:28 Cyrus would be used by God to guarantee the return of a remnant Jerusalem would be rebuilt and the Temple restored. 688 B.C. 538 B.C. As God named Cyrus even before he was born, God knows what will happen-he is n control. Jeremiah 25:12 Babylon would be punished for destroying Jerusalem and exiling God's people. 605 B.C. 539 B.C. Babylon was conquered by Cyrus the Great. God may seem to allow evil to go unpunished, but consequences for wrongdoing are inevitable. God will punish evil. Jeremiah 29:10 Th people would spend 70 years in Babylon; then God would bring them back to their homeland. 594 B.C. 538 B.C. The 70 years of captivity passed, God provided the opportunity for Zerubbabel to lead the first group of captives home. God's plans may allow for hardship, but his desire is for our good. Daniel 5:17-30 God had judge the Babylonian Empire. It would be given to the Medes and the Persians, forming a new world power. 539 B.C 539 B.C. Belshazzar was killed and Babylon was conquered the same night. God's judgment is accurate and swift. God knows the point to no return in each of our lives. Until then, he allows the freedom for us to repent and seek his forgiveness. Conquered Babylon. Established a policy of returning exiles to their homelands. Sent Zerubbabel to Jerusalem, financed his project, and returned the gold and silver articles that Nebuchadnezzar had taken from the Temple. He probably knew Daniel. Supported construction of the Temple in Jerusalem. Was Esther's husband. Allowed the Jews to protect themselves against Haman's attempt to eliminate their people. Had Nehemiah as his cup-bearer. Allowed both Ezra and Nehemiah to return to Jerusalem. God used these men to confront and comfort his people after their return to their homeland from exile in Babylon. Jeshua Encouraged the leaders and the people to continue rebuilding the Temple, whit God would bless. Challenged the people's careless worship, which God would not bless. Disobedience and careless obedience of God's commands lead to judgment. Joshua Emphasized God's command to rebuild his Temple. Gave the people another look at God's plan to bless the world through Israel and its coming King-the Messiah (9:9, 10). Encouragement for today's effort sometime requires that we remember God has a plan and purpose for tomorrow. Meanwhile the challenge is to live for him today. Malachi 430 B.C. The priests are the only leaders mentioned Confronted the people and priests with God's promises of judgment on those who reject him and God's blessing on those who live as he desires. God expects our obedience to him to affect our attitude toward him and our treatment of one another. Finally given the change to return to their homeland, the people started to rebuilt the Temple, only to be stopped by opposition from their enemies. God;s work in the world is not without opposition. We must not get discouraged and quit, as the returning people did at first, but continue on boldly in the face of difficulties, as they did later with encouragement from the prophets. Ezra returned to Jerusalem almost 80 years after Zerubbabel, only to discover that the people had married pagan or foreign spouses. This polluted the religious purity on the people and endangered the future of the nation. Believers today must be careful not to threaten their walk with God by taking on the practices of unbelievers.